Three options for the possible redevelopment of the Town of Vail Municipal site will be presented to the Vail Town Council at its evening meeting on Tuesday, Oct. 7. The discussion item is listed sixth on the meeting agenda which begins at 6 p.m. in the Vail Town Council Chambers with opportunities for public comment. 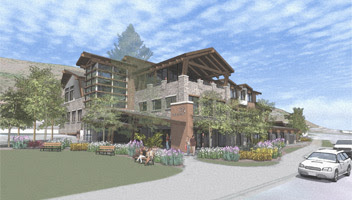 Rendering of proposed new Vail Municipal Building from 2012. Tuesday’s discussion incorporates design and budgeting work prepared in 2011 and 2012 when the town attempted to partner with Vail Valley Medical Center, Steadman-Philippon Clinic and the Steadman-Philippon Research Institute to redevelop the site. The plans failed to materialize, however, when the Steadman-Philippon Clinic withdrew from the project. Since then, the earlier municipal site preliminary design work as well as additional traffic, parking and circulation analysis as part of a VVMC facilities master plan process have been used to develop three options that will be presented by town staff Tuesday to determine the level of interest in moving forward with a redevelopment that would add structured public parking to the site. Construct a parking garage of approximately 160 spaces. This would allow for a more extensive redevelopment to occur at a later date and provides for future uses atop the entire area of the parking garage. Construct a parking garage of approximately 160 spaces and construct a new municipal building similar to the design created in 2012. Construct a parking garage of approximately 160 spaces, add 15 surface parking spaces and build a new municipal office building atop the parking garage on the western portion of the property. During previous discussions, a project budget of $15 million had been established for the town’s portion of the municipal site redevelopment, which included a three-story, 21,000 square foot building with connections to the existing police department wing to the east. The project also included a 220-space parking garage that would have been shared with the project partners. At the time, the Town Council had planned to pay cash from the town’s reserve funds and/or issue Certificates of Participation to fund the cost of the project. Certificates of Participation are a common method used by governments to pay for new government facilities. Tuesday’s meeting will be used to determine the level of interest by the Town Council and members of the public in pursuing a redevelopment on the site. The discussion will include a review of the project’s objectives created in 2011 and determining a timetable for possible next steps. For additional details, visit the town’s website at vailgov.com to review a staff memo on the topic. To comment on this agenda item in advance of Tuesday’s meeting, contact the Town Council at towncouncil@vailgov.com.